Every president rapes. Only one is an Oscar winner. In ABSOLUTE POWER, Clint Eastwood is super thief Luther Whitney, robbing a mansion when he is interrupted by two lovers entering the room. Luther takes cover and witnesses rough foreplay, until the man gets too rough for the woman and she retaliates by trying to stab him. The man, pinned on the floor, cries, “Help! Help!” and two Secret Service men shoot the woman (the glorious Melora Hardin) fatally from behind. The man is the American President (Gene Hackman). Judy Davis (who always looks like she never got enough sleep) is Secretary of State, and as she and her Secret Service men clean the room, Luther makes a break for it. The Secret Service men (Dennis Haysbert and Scott Glenn) pursue him, but he eludes them. With a secret that could topple the presidency. Absolute Power Corrupts Absolutely. ABSOLUTE POWER does not give us any ambiguity on how the American President is corrupt – he’s pretty much been handed the White House by his billionaire benefactor, Walter Sullivan (E.G. Marshall), the old man whose wife he just killed. And Hackman imbues the role with every ounce of contempt and duplicity that we know the actual President has for the American people whom he should be serving. The Prince song Thieves in the Temple has nothing to do with politics, but these lines could very well be applied to The White House: “…Don’t care where they kick / Just as long as they hurt you / There are thieves in the temple tonight.” And we begin to realize that the actual “thieves” in our temples are not those simple robbers in our houses who steal money and jewels – the thieves are in the highest temples of power, CREATING the social disparities that CAUSE the robbers in our houses. Ed Harris is police detective Seth Frank, misdirected off the murder scent by the cover up of the White House criminals; hot on the trail of Luther, but unable to prove anything. Besides, he’s hot on the TAIL of Luther’s estranged daughter Kate (Laura Linney), who is a trial lawyer, so he is stuck between a rock (the presidency responsible for murder – heaven forbid!) and a hard place (his pants). Once again demonstrating how real criminals (those in positions of sociological power) misdirect blame downwards. The thief becomes the focus of derision rather than the actual murderers. Remember that bandit mouse from the Klondike Kat cartoon? “Savoir Fare is everywhere!” That’s Luther. His daughter comes home with Seth – Luther is there; Seth is brushing his teeth – Luther is there; Sullivan gets into his town car – Luther is there. 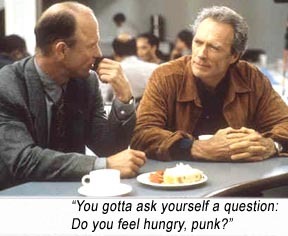 In a career of subdued roles, Eastwood directs himself in one of the most subdued, seemingly behind the scenes of the plot itself. While attempting to capture Luther, Scott Glenn and Ed Harris are paired up; though they are strangers from two rival departments at odds with each other, there is a nagging familiarity about them being onscreen together…Of course! These guys were astronaut pals in the Mercury 7 program in THE RIGHT STUFF! ABSOLUTE POWER is not “political” and makes no sociological statements. If anything, it underscores how the American president should be answerable for the crimes he commits – and we should already know that! In a more subtle way than usual, ABSOLUTE POWER shows us that Clint still has The Right Stuff. Though his character is a thief, he manages to retain the avenger idiom of his best anti-heroes and rights a wrong quite decisively. And takes down the President of the United States. Writers: David Baldacci, William Goldman. Starring: Clint Eastwood, Gene Hackman, Laura Linney, Dennis Haysbert, Scott Glenn, Ed Harris, E.G. Marshall, Judy Davis, Richard Jenkins, Melora Hardin, Mark Margolis, Elaine Kagan.